Looking for unique reception ideas to make your wedding reception a stand-out? From stylish decorations to bubbly cocktails, consider some of the top ideas that are trending this year! Offer guests a comfortable and stylish spot to relax and mingle during your wedding reception with lounge style seating. Not only will this cozy spot provide a place to chill and sip cocktails while taking a break from the dance floor, chic lounge seating will add ambiance and effortless style to your decor. A luxe couch paired with sophisticated chairs and comfy pillows will add a relaxing touch of home to your wedding celebration aesthetic. Make your reception effervescent with a bubbly bar! A champagne drink station offers an array of sparkling cocktails including mimosas, bellinis, and complimentary mixers like elderflower or raspberry liqueur. Post a bartender by the bubbly bar to stir up perfect champagne cocktails, or set up a self-serve bar. Acrylic accents will be a major wedding reception trend this year! Utilize this translucent material in seating charts, welcome signs, table numbers, acrylic “ghost chair” seating, and throughout the wedding decor. 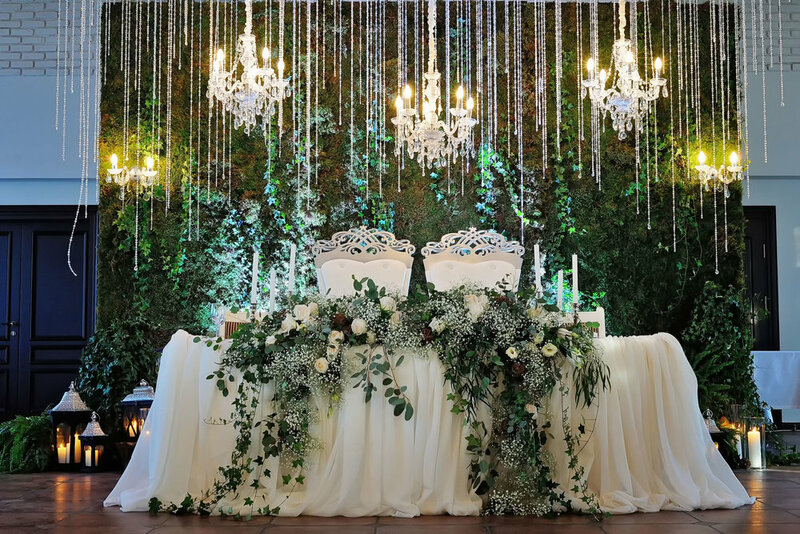 Typically associated with modern or minimalistic weddings, acrylic is gaining popularity and we are seeing it paired in surprising and delightful ways with traditional and bohemian style receptions as well. After an evening of dancing and celebrating, guests will undoubtedly work up an appetite for some late night snacks. Bring your unforgettable day to a delightful close by treating your guests to midnight snacks such as gourmet doughnuts or pizza. Or, as one last surprise, arrange for the arrival of a specialty food truck. Late night munchies will hit the spot as the wedding reception winds down and guests prepare to end the night. A fun and festive couple deserve an equally colorful wedding reception. Smoke bombs are the newest wedding trend for the perfect photo op. While sparklers remain a captivating send off for nighttime, if your reception is taking place during the day, consider crazy colorful smoke bombs. The bright burst of smoke will leave guests awestruck and guarantee fantastic photographic memories that will last a lifetime. As you dive into wedding planning, you may be interested in putting some of these trendy and of-the-moment wedding reception ideas into place at your celebration. Finding the right wedding vendors will put you in touch with the professionals who can bring these concepts to life!